I remember visiting my cousin Warren Zevon backstage at concerts, usually in the green room with the names of other artists scrawled on the walls and ceiling. His manager would prevent fans from disturbing us while we enjoyed this family time. With most of our family living on the East coast, Warren’s concert schedule in New York, Boston and Rhode Island always included family coming to visit. There were very few opportunities other than his concerts to get together, so this is where our stories and pictures were shared. Warren passed away a few years ago and after he did we connected with his daughter Ariel, her husband Ben, sons Max and Gus (the coolest twins ever) and ex-wife (and Warren’s close confidant) Crystal Zevon. Warren would have liked that we now have each other – most importantly our kids – in our lives. We don’t spend as much time together as we’d like, but we have email and Google Chat! In a few weeks we will be together at a benefit concert Jackson Browne is giving to raise money for the local agricultural community exchange (LACE) in Barre, Vermont. LACE is Ariel’s passionate effort to bring locally grown foods back to the community, to support local growers, farmers and businesses, as well as help people eat healthier. 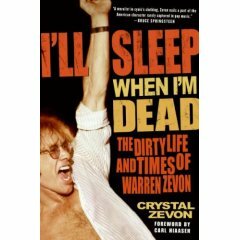 Crystal’s passionate work is the recently released book Warren asked her to write, I’ll Sleep When I’m Dead: The Dirty Life and Times of Warren Zevon. An honest look at Warren’s life (sometimes painfully honest – not exactly the conversations we had back stage), the book tells the story of Warren’s life from those who knew him best. I’m not done reading the book, but I can say that it is very interesting, well written and worth picking up a copy. It’s a perfect Summer read because the chapters are broken-down with bite-size entries. If you have to put it down, jump in the waves and help dig a moat around the sandcastle, you can easily pick-up where you left off. It’s this same writing structure that has you convinced you can read the next bit and the next (and the next) and before you know it it’s 1:30 in the morning and your day begins in 5 hours! Thanks for this, Lawrence. I’m a new friend of Crystal’s, having recently helped her with a book signing in Western Mass. Any support of the book and Herself is something that I’m grateful for and goes a long way to spread the importance of Warren’s music. That’s what it’s all about for Crystal. I look forward to meeting you at the Jackson show, my husband and I will be there with bells on. Any time Crystal! Very excited about seeing you and everyone in a few weeks. I have to believe you guys will be out of your minds busy so we’ll lay low. Looking forward to meeting you too Maggie, should be an excellent show!